The E-Footgear sensors will create a point with a Truescore E-Hogu when impact occurs at or beyond the adjustable impact requirement. 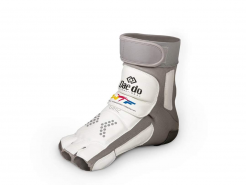 The E-Footgear should be owned and used by each individual competitor. *This E-Foot Gear Grey has the same amount of sensors as its predecessors with the black cloth. *The red patch sewn to the ankle of one of the Foot Gear pair is an NFC tag with a unique ID that can be read from any device with NFC capabilities/program. XL10-11 XXL11 ½ -12 XXXL 12 ½-13 ½ XXXXL13 ½ -15. Please note that our E-Foot Gear are made with elastic, so if you have a wide foot (EE) you may need to buy a larger size than you normally do. If you have slim foot, you may need to buy a smaller size than you normally do.